It’s also the reason why ALPA is the largest nongovernmental aviation safety organization in the world, powered by airline pilots who volunteer their time and expertise to make the safest mode of transportation on earth even safer. And today, ALPA proudly celebrates National Aviation Day by sharing just a few of our pilots’ many contributions to aviation safety and security. Maybe you’ll notice them on your next flight. As the largest nongovernmental aviation safety organization in the world, ALPA has long asserted that the best safety feature of any airplane is a well-trained, well-rested, highly motivated flight crew. 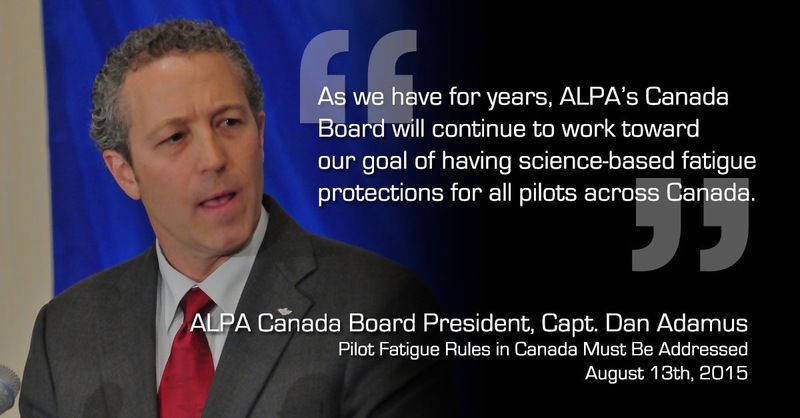 For years, ALPA’s Canada Board has joined together with Canadian officials and aviation stakeholders in a tremendous effort to develop flight-and duty-time regulations and minimum-rest requirements for airline pilots that are based on sound science. Today’s closing of the Department of Transportation’s (DOT) comment period showcases yet again the outpouring of concern about the U.S. government’s need to ensure a fair marketplace by entering into consultations with the governments of the United Arab Emirates (UAE) and Qatar to get the facts on the subsidies they provide to Emirates Airline, Qatar Airways, and Etihad Airways. Today, ALPA released a new white paper titled Keep America Flying: A Flight Plan for Safe and Fair Skies. It lays out reasoned and achievable policy solutions to enhance aviation safety and provide a strong and fair economic environment for U.S. airlines and their employees. 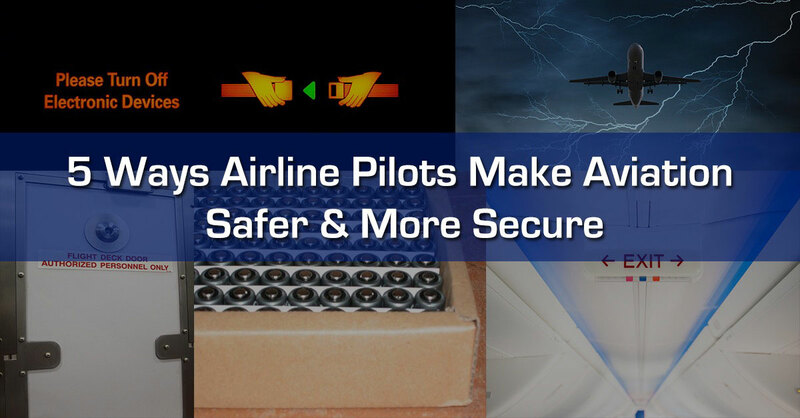 Safety and security topics detailed in the white paper include airline pilot supply, unmanned aircraft systems, NextGen, safe air transport of lithium batteries, secondary cockpit barriers, science-based fatigue rules for all-cargo pilots, and the Federal Flight Deck Officer program. 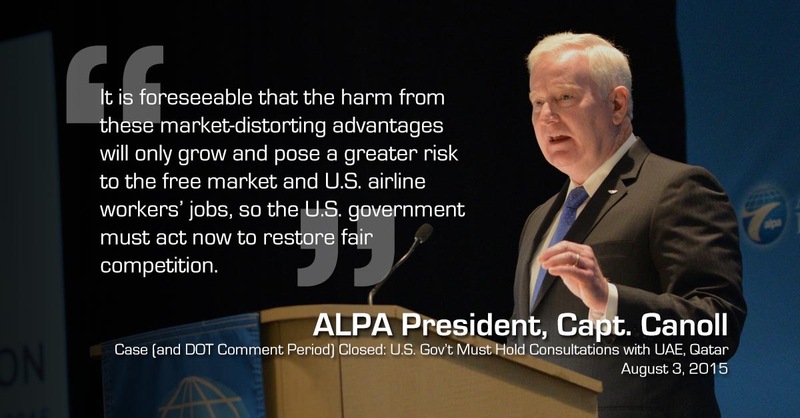 In addition, ALPA’s Keep America Flying flight plan underscores the need to ensure that U.S. airlines and U.S. airline workers have a fair and equal opportunity to compete in the global marketplace. Economic policy subjects discussed in the union’s white paper include flag-of-convenience and other atypical business practices, upholding the promise of Open Skies, and reforming the U.S. Export-Import Bank.